Building new or extending existing Horse Arenas (Sand Schools) is a very technical area of Equestrian Construction that WDJulyan excels in. 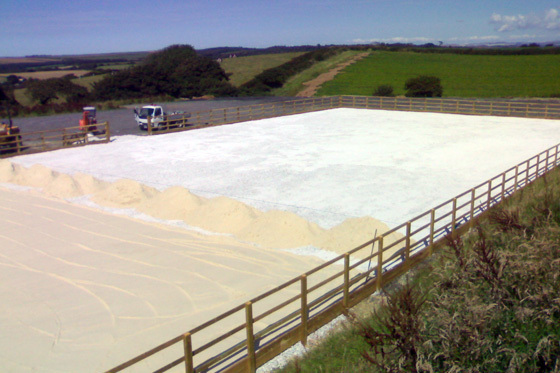 We have an in-depth knowledge of the layering and levelling of the different surfaces (Drainage Stone, Aggregate, Silica Sand, Chipped Rubber) required to make up the best performing Horse Arena. The latest Grading Lasers are always used to ensure accuracy throughout all aspects of the job. Using this technology enables us to be precise with drainage falls and overall ground levelling of the Horse Arena. WD Julyan also carry out more general construction work essential for Equestrian and Agricultural sites such as Drainage, Water Pipes, Troughs, widening and creation of Gateways as well as Stable and Shed construction. WD Julyan built two Outdoor Horse Arenas at Colraine Equestrian Centre - www.Colraine.co.uk This included everything from levelling the original brown field site to bringing in the Single Size Drainage Stone, Aggregate, & Silica Sand. Once each of these layers were levelled & graded to the correct level the surface could be finished off with the Chipped Rubber. WD Julyan also constructed the Horse Arena Fencing and entranceway to the Horse Arena. Alterations were also carried out to the Indoor Horse Arena to enlarge the original Horse arena and resurface and level the entire area. See for yourself the range of sand schools and agricultural buildings WD Julyan has worked on. Click [here] to see examples of Equestrian and Agricultural Construction Projects.